I am running gimp 2.28 on Fedora 26 (kernel 4.13.5-200). I installed gimp through the dnf package manager. 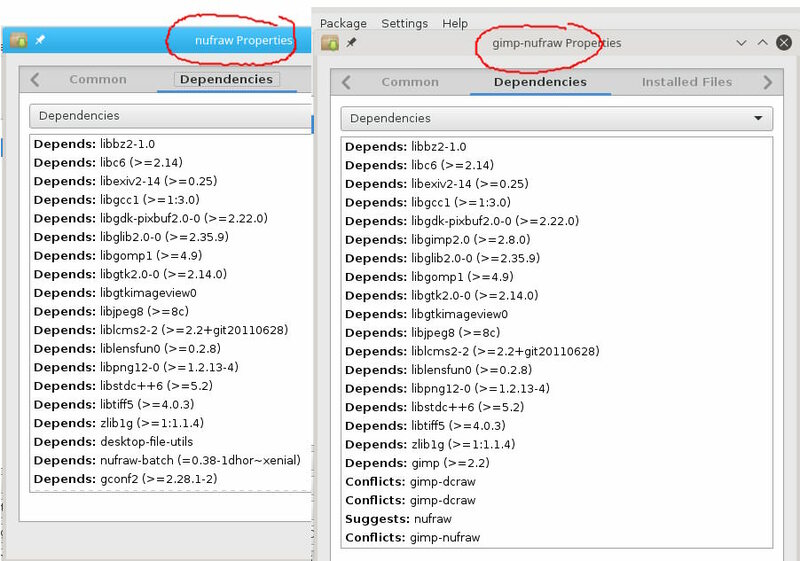 The installation included libopenraw-0.1.2-1 as a dependency. However, I cannot open PEF raw files from my Pentax camera. The gimp open dialog does not even see the .pef files. I can install the ufraw-gimp package and open the files. However, the ufraw interface actually gets in the way of some things I want to do. What makes this more curious for me, I was able to open the PEF files without installing ufraw-gimp on one or more previous versions of Fedora. Unfortunately, I did not record the details of the previous version because I didn't know I would need them. I can open the PEF files in darktable and gwenview, but I assume they use different libraries. I see libraw1394 and LibRaw in my rpm listing. Is this a known problem? What can I do to troubleshoot the problem? I am willing to build from source for troubleshooting. Eventually, I would like to get back packages for convenience and consistency. So the problem appears to be with gimp or at least its interaction with libopenraw. First, you are unlikely to get a Fedora-based reply on this forum. There might be a Fedora user or maybe not. I use Kubuntu 16.04 & bearing that in mind. Quote: ..However, I cannot open PEF raw files from my Pentax camera. The gimp open dialogue does not even see the .pef files. Quote: ...I was able to open the PEF files without installing ufraw-gimp on one or more previous versions of Fedora. However the gimp plugin does work, https://i.imgur.com/MU9fvdU.jpg but as expected you only get an 8 bit image. Quote: I can open the PEF files in darktable and gwenview, but I assume they use different libraries. I see libraw1394 and LibRaw in my rpm listing. It is also a good place to ask your question, https://discuss.pixls.us I think there are Fedora users there. 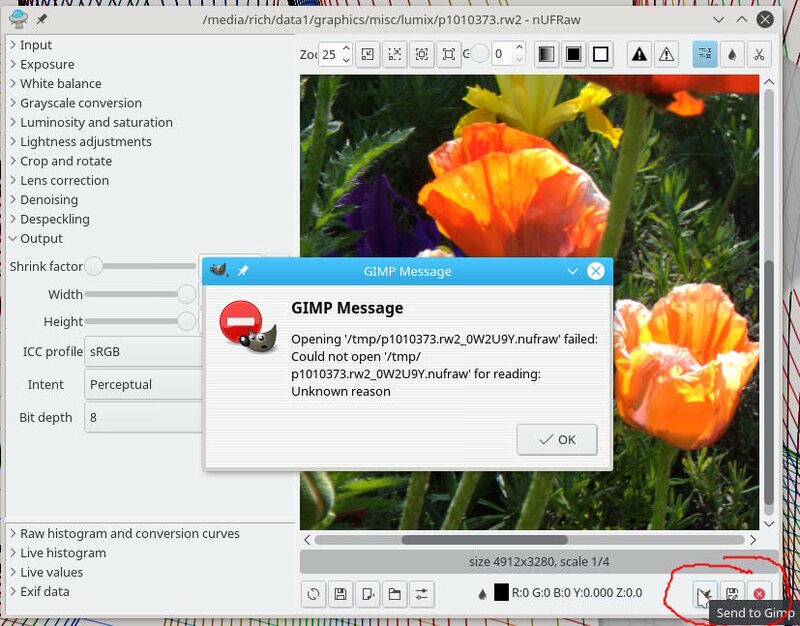 Actually, GIMP will open RAW files in various formats *IF* the build incorporates libopenraw. 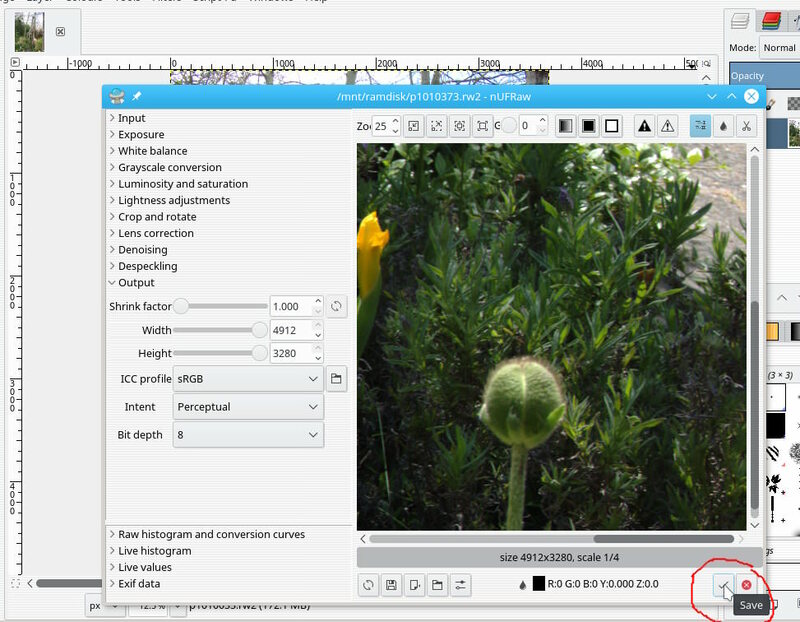 It is mentioned peripherally in the "Artist's Guide to GIMP" blog page "Building GIMP source" (https://www.artistsguidetogimp.com/?page_id=55). In addition, Fedora includes a ufraw-gimp package that allows GIMP to use ufraw as a front end to open RAW files. The problem with ufraw-gimp for me is that opening a RAW file first uses the ufraw interface before the image is opened in GIMP. If I want to automate a GIMP workflow with PythonFu, there is no procedure to open with ufraw. There is one for opening RAW files witih libopenraw, "file-raw-load". I assume ufraw-gimp is available in all Linux distributions. I have just gone through the exercise of rebuilding the GIMP, GEGL, and BABL packages. GEGL requires libopenraw-devel, But the GIMP build for Fedora 26 doesn't seem to incorporate it. I'm trying to figure why, or more correctly, how to achieve the incorporation. I suppose my next step will be to ignore the Fedora packages and build GIMP from the git source tree. That will have to be another night.